I can't believe my babies are already 10 months old! They are getting so big and learning so many new things all the time. They like being outside right now and going for walks in the stroller. We recently tried the baby swings at the park, which they really enjoyed. But, what they really love right now is food. They are interested in trying everything and want to grab and eat all that they see! They still like their homemade purées, especially with oatmeal or whole milk Greek yogurt. They prefer chunkier foods now though and are trying more finger and table foods all the time. 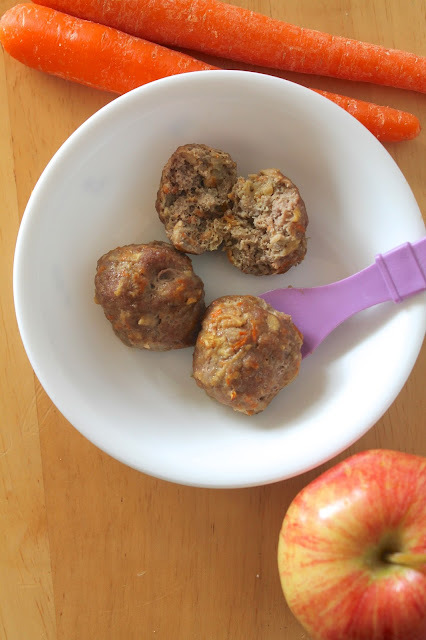 I bought some frozen turkey meatballs and they really enjoyed those, so I decided to make a homemade version that is a little healthier for them. I still cut/break up these meatballs into smaller pieces for them at this point. They are picking up those pieces and feeding themselves.... a messy, but fun, time. This recipe will make about 27ish meatballs. You can freeze them (place on a clean baking sheet in the freezer just until frozen and then place them all in a freezer bag) and then defrost in the refrigerator as needed. Heat them up in the oven or microwave, or even in an alfredo sauce. They can be eaten cold as well. The spices below are what I used, but you can use so many others like thyme, nutmeg, allspice, parsley, coriander, ginger, and others -- whatever flavors and combinations you want! They are also delicious for adults too - I've popped more than one in my mouth! 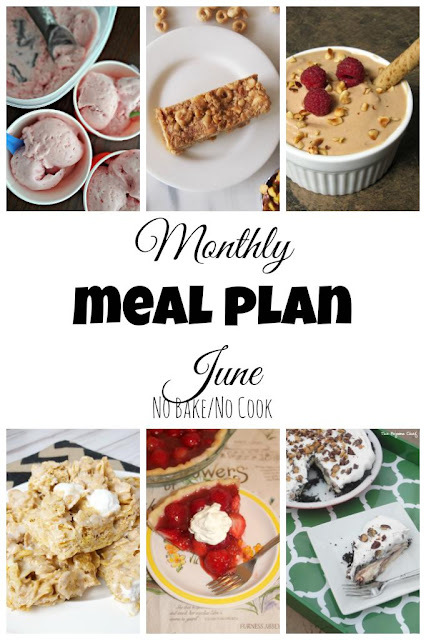 It's time for the June Menu Plan, which is really a June dessert plan! We have a bunch of tasty no-bake treats for you to enjoy as you kick-off the summer. Check them out below! I had a lovely first Mother's Day this past weekend. Mother's Day used to be a very difficult day for me, but this year was different because I had my two amazing babies to spend it with along with my husband and our families. We had a picnic lunch this year that was interrupted by some rain, but otherwise it was a beautiful day. 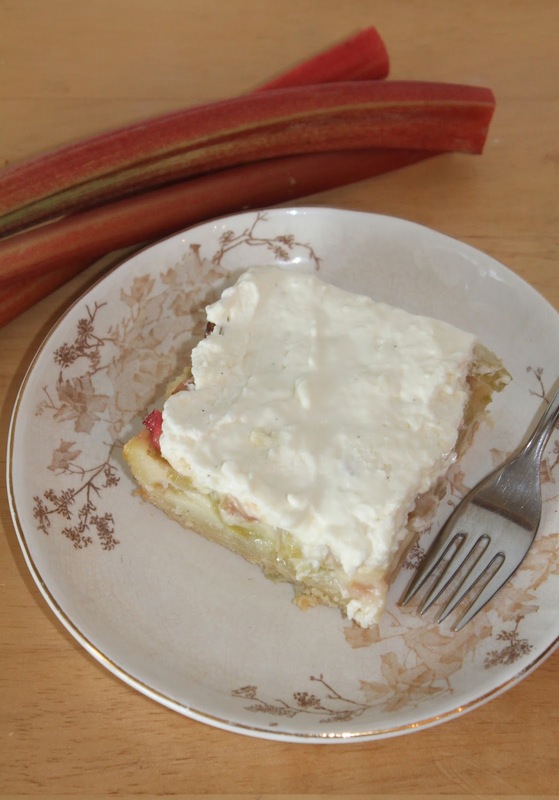 I made these rhubarb custard shortbread bars for a dessert (adapted from this recipe) and they were a hit. These bars are decadent and I've lightened them up a bit on the sugar and fat from the original recipe. They have a shortbread crust, then a tangy yet sweet custard middle, and then topped with a lightly sweetened vanilla cream cheese whipped cream. I mean, how can you resist all of those things combined?! This recipe will make a lot of bars, so they are perfect for a gathering or picnic. I'm kind of into rhubarb lately, as you may have noticed from my rhubarb recipe round-up last week. I also still have a grocery bag full of it from my father-in-law's garden, so be on the look-out for even more rhubarb recipes over the next few weeks. Not that there's anything wrong with strawberry-rhubarb pie, of course. It's delicious and it's a classic for very good reason. But, there are so many other tasty things you can make with rhubarb. It's often an under-appreciated ingredient, but it's popping up in gardens all over our area right now, so it's the perfect time to explore other uses. Please check out all these recipes utilizing rhubarb for all meals of the day and in both sweet and savory dishes. 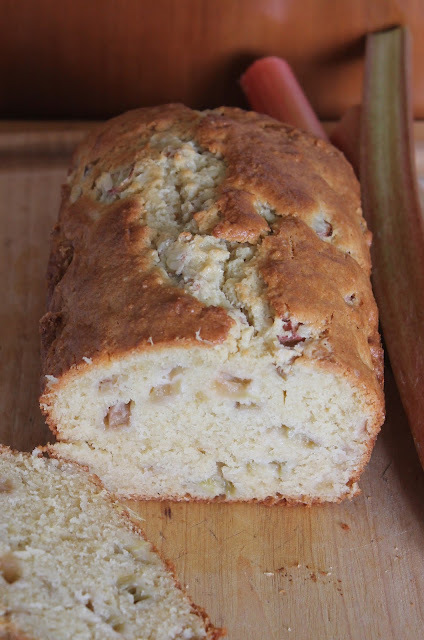 I hope you are inspired to add more rhubarb recipes in your kitchen. 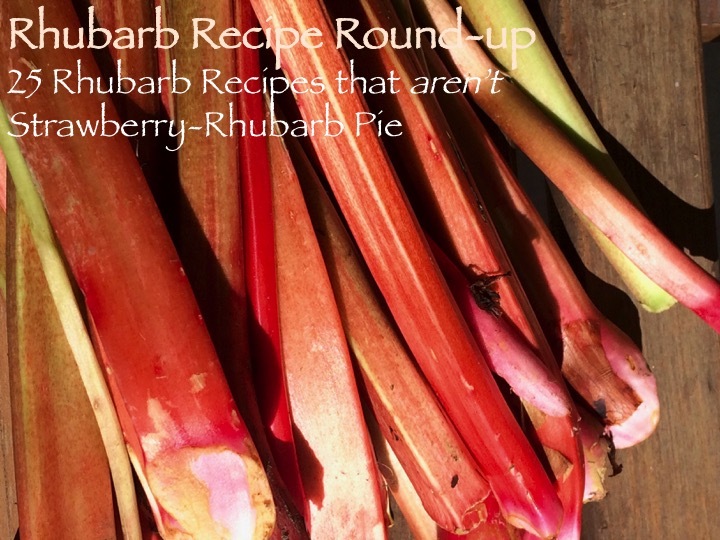 Follow my Rhubarb Recipes Pinterest board for even more inspiration. I would love to hear your favorite rhubarb recipes as well! Golden potato, broccoli, & cheddar mash (Boil in water - 1 peeled and chopped golden/yellow potato and 1/3 cup frozen broccoli florets until soft. Drain. Mash with 1/3 cup grated white cheddar cheese and milk to your desired consistency). 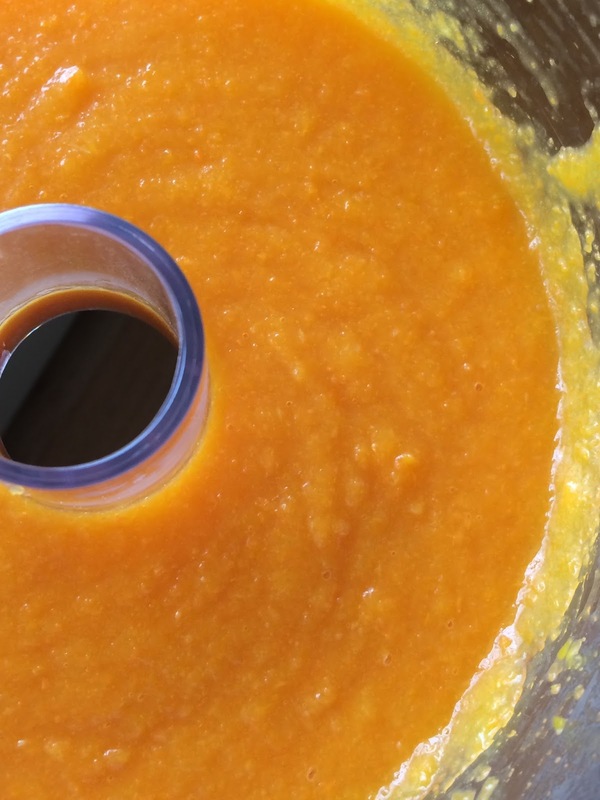 I don't like to puree potatoes as they tend to become gummy. Ours twins are starting to move on to chunkier purées and some more finger foods now. They have entered the "Stage 3" baby food time (9 months). They recently tried commercially available puffs and melts and enjoy learning to pick them up and feed themselves. They've also been trying more of our foods like chicken, roasted vegetables, turkey, and pasta. However, they still are eating smoother purées, cereal, and yogurt as well. That's what they still eat the most of right now while they are learning to grasp and feed themselves more and more each day. Carrot, mango, & yellow bell pepper purée (Steam one cup of chopped carrots until almost soft and then add 1 cup frozen mango chunks and 1/3 cup chopped yellow pepper. Cook until soft and purée to your desired consistency using steaming water).